Every year when fall rolls around, I'm amazed at the many ways people use pumpkins. Their creative ideas for decorating, carving, and displaying them are so inspiring. It makes me want to buy dozens of pumpkins and try their ideas myself. Although I haven't purchased any pumpkins yet, I did create some colorful gourds for my home's fall decor. It's onto pumpkins next! I've also discovered that pumpkins aren't just pretty objects; they can also be functional pieces when it comes to entertaining. Today I've collected some practical party ideas straight from the pumpkin patch. If you host any fall events this year and have a few extra pumpkins laying around, try one of these Pumpkin Party Projects to add an extra special touch to your celebratory decor. Running low on serving bowls? No problem. 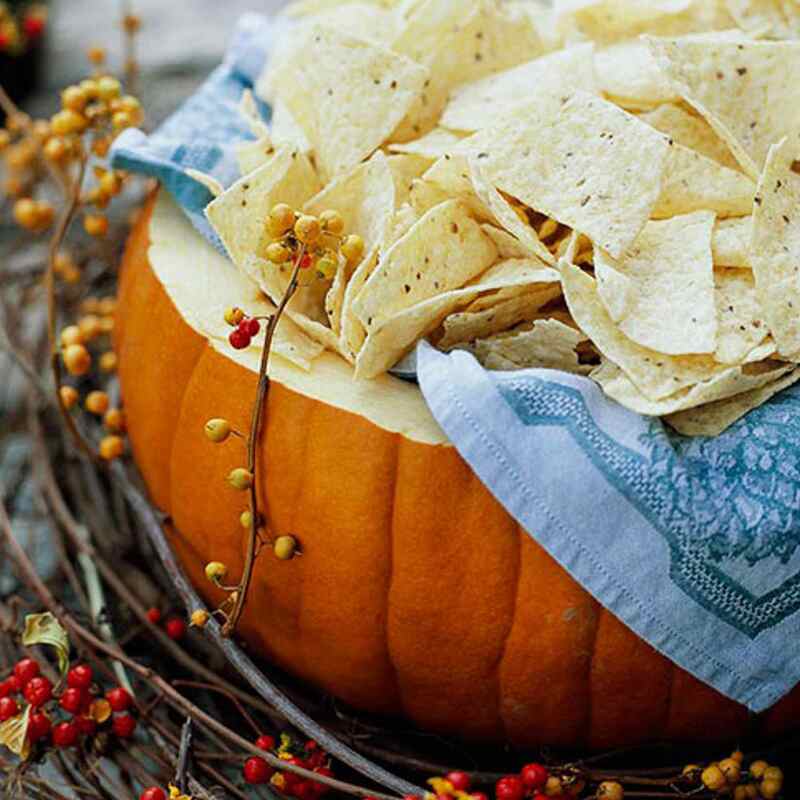 The folks over at Better Homes and Gardens turned a pumpkin into a bowl for chips. Autumn wouldn't be complete without pumpkin beer. And, the only thing better than drinking beer this time of year, is drinking it through a carved pumpkin. You read that right. Celebrations is teaching you how to make a pumpkin keg. If you don't have a pumpkin keg, a hollowed out pumpkin can be filled with ice and used as a place to keep your beverages cold. Check out how Waiting on Martha used this idea in her Southern-inspired tailgate. It's amazing how much a pumpkin can transform any event. A Fabulous Fete turned small white pumpkins into mini place card holders. They are elegant and downright pretty. You can even cook in pumpkins. I'm drooling over this Pumpkin Spice Creme Brûlée prepared right in a mini pumpkin. It's stunning and sure looks delicious. Want a unique centerpiece? I love this tutorial from Elizabeth Anne. She teaches you how to build a centerpiece on top of a Cinderella pumpkin. Setting up a buffet and looking to add a bit of interest? Southern Living likes to top pumpkins with serving plates to add height and drama to their table. Finally, use a little paint to say something. The folks at Babble shared this idea for these no-carve typography pumpkins. For a party, you can use this idea to spell out a message to your guests. As you can see, the options for pumpkins are endless. What other fun ideas do you have for entertaining with pumpkins?